High School Inorganic Chemistry is an American app suitable for K-12 (12th Grade 17-19) and Key Stage 5 and above for the UK equivalent. 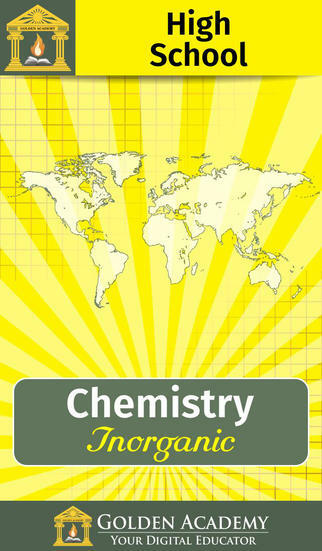 The app has a vast amount of content and concentrates on topics for Organic Chemistry with over 700 questions. Such topics include Elements, Compounds, Halogens and many more. The app contains detailed questions, test analysis of the students’ performance, hints for solving questions, progress graphs and more. 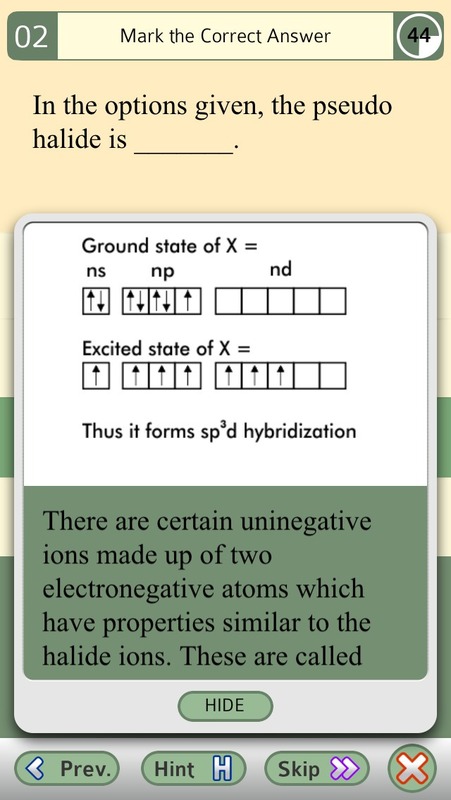 The app is very interactive, presented well and would be considered as a good revision tool for Organic Chemistry. Chemistry teaches students to view the world with discerning eyes. The typical A ‘level student which this app is aimed at, must have a working knowledge of the basics of organic, physical and inorganic chemistry. The app opens with interactive user instructions which are very helpful as the app looks complicated at the start. After reading the help section the user is introduced to a range of topics with questions. The questions and topics supplied are vast and each section has multiple questions. Once the question has been attempted the user can access a tip and explanation to the question. The HINT button is obvious although a little too tempting at times. We believe it would be helpful here to have a tick against the question as soon as you answer it rather than waiting to the end of the section. The app recommends that you achieve 75% before moving on and this goal enables students to access whether they have a good understanding of each topic. The opportunity to review the topics in their own tests before taking the overall chapter test is useful and the link of the units to real industrial processes is very good. When the wrong answer is given, the review of the correct answer is given in a summary at the end of the test. Where this app really comes into its own is the recording of the students’ progress and analysis of the questions answered which is detailed and demonstrates an excellent understanding of pupil progression. The ability to share the outcome of the tests via email or social media makes it easy to use as a homework if necessary and teachers can review and see their students tests results which could inform planning. The app would be better if it also incorporated the opportunity to review the material before taking the test. 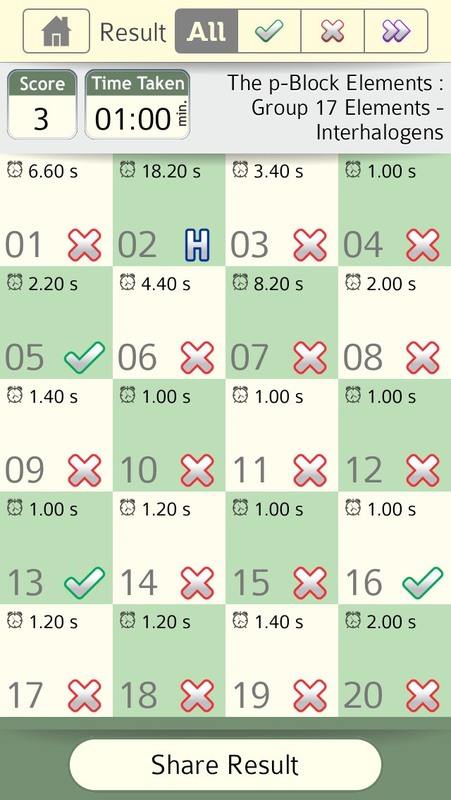 The Hint button is useful when you simply do not understand the question and the full explanation is also given in the summary at the end. The number of correct answers discounts this hinted answer and this gives students targets of which questions to review. 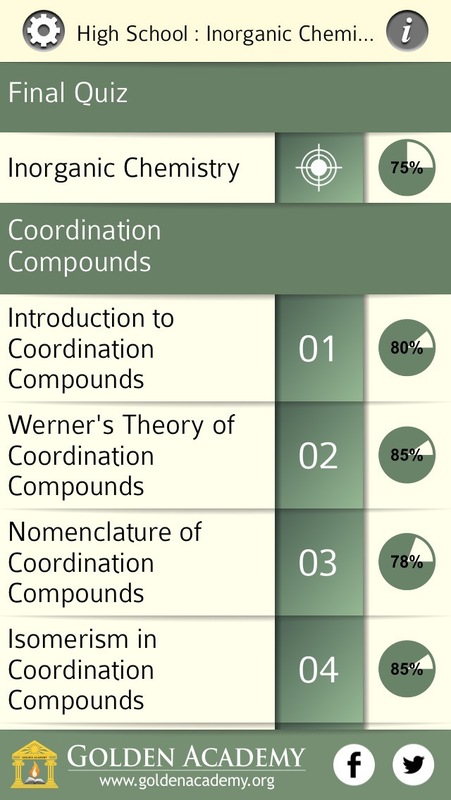 For the US market, this app would be excellent, it still needs to have more of the British inorganic syllabus materials included to ensure that students will be reviewing and learning material that will appear on their exams. There are some issues with the way that material is presented which does not always make it explicit as to why the answer given was achieved, but overall a useful app when used correctly, may help students to further their understanding of inorganic chemistry reactions. High School : Inorganic Chemistry is a complete resource for CCSS & K-12 High School Inorganic Chemistry. With systematically planned topics and comprehensive explanations it makes sure that the student gets thoroughly prepared for the exams. Searching for the best resource for High School studies? Golden Academy presents "High School”, a series of fully featured education apps for all the High School subjects, created by a group of professional teaching experts from USA and Europe with more than 30 years of experience. Learn Inorganic Chemistry topic by topic and test your understanding in a Topic Quiz. Once you have mastered all topics, take the Final Exam to test your proficiency in High School : Inorganic Chemistry. • Store complete history of all the test attempts.